When applying sunscreen on the beach, the average person's sole concern is that they covered enough of their skin to avoid a painful sunburn. (We've all been there.) But for snowbirds who frequent Key West, there will soon be something else to worry about. On Tuesday, Feb. 5, the tropical vacation town passed a measure banning sunscreen containing two specific chemicals that have been linked to harming coral reefs. Key West is not the only city to institute such a ban, so here's what you need to know about the new legislation. As The Guardian reported, Key West's city commission voted to ban the sale of sunscreens made with oxybenzone and octinoxate. The legislation, which passed 6-1 on Tuesday, will not go into effect until Jan. 1, 2021, according to the New York Times. 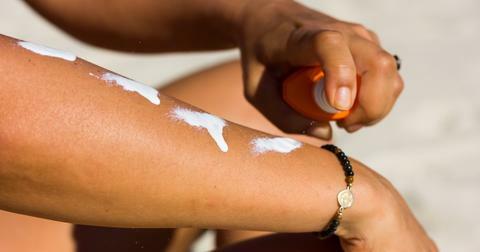 That leaves plenty of time for local shops to transition the sunscreens they offer. In addition to banning the sale of these sunscreens, Key West's new legislation will sort of ban the use of them. As the New York Times reported, the bill was backed by Teri Johnston, Key West's mayor. The mayor said that people discovered to be using sunscreens containing oxybenzone and octinoxate will simply receive a warning the first time, but they will be fined after being caught a second time. Additionally, people with prescriptions for specific sunscreens will also be excused from following the law. “We have one reef, and we have to do one small thing to protect that ... It’s our obligation,” the mayor said, according to The Guardian. A variety of studies have found that oxybenzone and octinoxate have negative effects on coral reefs, which are "large underwater structures composed of the skeletons of colonial marine invertebrates called coral," as per Live Science. Coral reefs are important for a number of reasons — mainly, they're invaluable ecosystems that support underwater biodiversity. So if using a different sunscreen has even a small part in preserving coral reefs, it's definitely worth making that change. A 2015 study by the University of Central Florida found that the water surrounding coral reefs frequented by tourists in Hawaii and the Caribbean had the highest concentrations of oxybenzone. According to the study, oxybenzone can cause deformities in coral larvae as well as coral bleaching, which eventually kills coral. The Ocean Conservancy also explained that the way that both oxybenzone and octinoxate kill coral reefs is because the chemicals make it harder for coral to defend itself from bleaching. It's important to note that sunscreen is far from the only thing negatively impacting coral reefs. As Roger Bradbury wrote in a 2012 op-ed for the New York Times: "Overfishing, ocean acidification, and pollution are pushing coral reefs into oblivion. Each of those forces alone is fully capable of causing the global collapse of coral reefs; together, they assure it." Mayor Johnston agrees with this philosophy — and she believes that just because we may not be able to do everything to preserve coral reefs doesn't mean we shouldn't do something. “Our coral has been under attack by a number of stressors,” Johnston said, as per the New York Times. “We just thought if there was one thing we could do, to take one of the stressors away, it was our responsibility to do so,” she added, referring to the new legislation. #Repost @themistylister ・・・ Folly Beach friends!! Great news from @allgoodbrand sunscreen: 1) We are sponsoring the @follybeachwahine #surf contest with a complimentary Sunscreen Station, THIS WEEKEND June 2 - 3rd. Come say "hi" and ditch your chemical sunscreen! 2) All Good Brand is now sold at @bertsmarket!! Move over Copertone, #reeffriendly sunscreens are in the house! Big shout out to surfer and reef safe advocate @tanyaboggsphoto for this awesome Folly Beach shot. As mentioned above, Key West is not the first place to ban oxybenzone and octinoxate. In summer 2018, Hawaii passed a bill banning the two chemicals from sunscreen statewide, which will also go into effect in 2021, the Washington Post reported. Additionally, in late 2018, the nation of Palau announced its plan to ban sunscreen made with any of 10 toxic chemicals (including oxybenzone and octinoxate) all across the country. Luckily, there are plenty of sustainable sunscreen options that will keep both your skin and the coral reefs safe. If you're in the market (or if you're planning spring break 2021 — Key West, baby!!! ), check out brands like All Good, Coola, and Babo Botanicals .